One of the most valuable parts of a piece of music is the melody. That may seem obvious, right? Think about it. When you’re walking around your house, driving in your car, taking a shower, or doing some mindless work, what is it that you are singing to yourself? The melody to a song you like. It’s not usually the chords or the beat. Those are both valuable things, but the melody is usually what sticks out. Melodies are catchy, and that’s why most pop-radio hits have relatively simple harmonic structures and especially catchy melodies. The idea is to get that melody stuck in as many people’s heads as possible and get it to go viral. The other aspects of the composition, like the chords and groove, are there to elevate that melody. Now jazz music is a little bit different than most pop music in the sense that the harmonic movement is heavily emphasized. In fact, this is what makes jazz improvisation so interesting. Jazz musicians have lots of chord progressions to explore and navigate. There’s chromaticism, chord extensions, and alterations. Jazz standards are truly a harmonic playground, with so many different aspects to explore. This is why Bebop emerged. Bebop was a departure from the singable, danceable music of the Swing Era. In fact, the only time in history where jazz was popular music was during the Swing Era, where strong melodies and danceable grooves were what it was all about. Bebop was all about virtuosity and a musicians ability to navigate chord changes in creative ways. Regardless, the melody is almost always the most defining part of a song. That’s why in jazz we play the “head” (the melody), take solos, and then end the song with the head again. At least, this is traditionally what happens. Because the melody is so important, you’d think that it would be one of the first places we go when taking a solo, right? Well, unfortunately, a lot of jazz musicians forget the melody altogether. We’re all guilty of this, including me! Think about a blues for example: It’s usually a 12 bar form, and though there are harmonic variations, it’s more or less the same chords. So what makes one blues different from the other? You guessed it, the melody. Therefore, shouldn’t our jazz solos over a blues have something to do with the melody? I’d say so. My challenge to you today is to try to think less about guide tones, licks, scales, and think more about the melody. These are all great tools I’ve just mentioned and should be used, but let’s try to step back for a second. The melody is important, and it has a ton of potential in itself to make us better improvisers. I have a great exercise for you to practice today. Warning: This exercise is not as easy as it sounds! The boundaries set up make this tough to do. You’ll see what I mean. 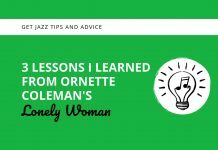 I also want to mention that this lesson comes straight out of our eCourse 30 Steps to Better Jazz Playing, which is a course that takes you through 30 days of focused, goal-oriented practicing where you work on stuff that will make you a better jazz musician. It’s a course that has gotten a lot of great reviews from our students, and this is just a tiny taste of some of the stuff you work on. Certainly, check it out if you think this is something that could benefit you! The first chorus, just play the melody completely straight. Essentially, there is no improvising happening yet. During this chorus, you are establishing exactly what the melody is. The second chorus, embellish the melody. What does it mean to embellish? You are using the melody as a “guideline”. You can veer off from the melody a bit, but not too far off. You want to be clearly hearing the melody throughout the chorus, while still taking liberties with it. The third chorus, reference the melody. 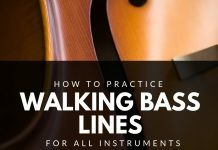 You can go ahead and improvise freely and don’t necessarily have to stick so tightly to the melody. But you will need to reference it from time to time. Someone who just walked into your practice room should be able to eventually pick up what song you’re playing because you referenced a part of the melody. Now, of course, it’s only fair that I demonstrate this for you. I’m a guitar player so I’ve pulled out my guitar and recorded an example for you below. Give it a listen, and see if you can follow along! Phew! That was tough for me! It was difficult to stay restrained to the rules I set up for each chorus. Full disclosure: I think I over-embellished the second chorus (embellishment), but that’s okay, it’s time to hit the shed. Did you hear my references in the 3rd chorus? I allowed myself to improvise freely but tried to come back and use pieces of the melody throughout. If you try this yourself, you’ll see the challenge. I think some of the best practice is when you set up boundaries for yourself. That’s what the practice room is for. So let’s all start using the melody more in our solos. Try this exercise, and tell me how you do in the comments below. Wow! What a fantastic post! I've been thinking about and working on this pretty hard for the last couple of years and it has definitely leveled up my playing. To me, Louis Armstrong's solos are the prototype for this – he always gives you that melody, though always in interestingly tweaked and distilled ways. And if Pops did it like that, well..
Also, thanks for the example recording on Blue Bossa. I very clearly hear the 3 stages, and could definitely hear your "references" to the melody in the 3rd chorus. Well done and thanks for the further inspiration. Brent – sorry to be so thick, but where's the link to hear you on this ? Hi Ian, are you able to see the audio player? If it's not blocked on your browser for some reason, should be able to press play and hear it! Hope that helps! After reading this, I thought by myself: There is a god! Vindication! I have been playing like this all my life, but often thought (and sometimes actually felt quite inferior to the cats racing through chord changes as if there was no tomorrow) that I wasn't a 'real' jazz or improvisational player, because I often tend (without thinking) to cite fragments or small variations of what I call the 'golden' or 'shiny' fragments of the melody when improvising – those small parts that instantly create a certain mood and revive in the listener the 'feel' of that song. Similar to the 'Cry Me a River' lick I guess. Sounds like you're doing something right there Ozzoid! My best piece of advise: play who you are and play your best. Don't worry so much about what others are doing. Cheers!